Poetic Licence starts suddenly, with Greg Byron getting into the show immediately. He greets the audience and interacts with them throughout, aided by the Treasury 1860 front bar’s cosy setting. The show covers topics as varied as Donald Trump, Margaret Thatcher, gun control, and Brexit – while still finding room to take a brief poetic detour to encompass Doctor Who. Byron tests spoken word limits in a variety of direction as he shows humour and seriousness as needed to discuss important current affairs. It’s a treat for the audience to be directed through so many topics and engaged so fully. Byron effortlessly communicates with the audience and though audience involvement may be a thing of terror for a great many, here you are in the hands of someone who knows exactly how far to take it and exactly how best to elicit the desired responses. The performance was fast-paced, kept the audience’s interest, and when it was over left everyone wanting more. With a great variety of subjects and an interesting take on them all, this performance feels too quickly finished, and when that is the only criticism, you know the show is a good one. Byron shows his talent in wordplay and pushing language to achieve things both insightful and impressive, often at once. He eschews expectation and can take the audience down an unexpected pathway to the delight of all in the audience. He seems to go well beyond simple wordplay and achieve some sort of word experiment that never fails to yield something worthwhile. If you are interested in trying a spoken word performance and not yet done so, Greg Byron’s Poetic Licence is an excellent place to start. To spend an hour at Greg Byron in Poetic Licence is to spend an hour experiencing what entertainment must have been like in the presence of a troubadour in an Elizabethan court. And by this I do not mean this show is an olde worlde confection, but rather it is a contemporary experience of having a poet distill issues of the day with disarming and delightful wordplay. From anger over the state of the environment and world politics to the wonder of relationships and science, many topics and themes are covered as Gavin Robinson’s Greg Byron regales his audience with wit, warmth, and the occasional cringe. Greg is an engaging character, dressed in fine costumery, with poetry in hand and a wink in the eye, who engages his audience as he recites his poetry with Thespian flourish. If you have an aversion to rhyming couplets, you might find this show hard going but if anybody could restore your faith in this style of poetry it would be Greg Byron. His poetry needs to be heard and he brings it to life with beautiful variations in pace and tone. Because Greg has the ability to modify his “set list” each night, do not let him leave before he performs his poem about an 82 year old man reflecting on life. In this work, we see the world reflected in a stranger’s eyes and in doing so we touch many common truths about being human. Wordshow is a show about words. Lots of words. Clever words, funny words, dry words, sardonic words. Words, words, words. Comedy for thinking people. Greg Byron, the alter ego of Fringe doyen Gavin Robertson, is angry. Which means he’s awake. And firing out words like bullets from a machine gun. Fast, fiery, punchy, on target. What do you mean, you’re not angry? Are you awake? Wide awake is the one thing you need to be at Byron’s latest Fringe epic, Wordshow, which does exactly what it suggests in its title. It’s a show full of words. Lots of words. Clever words, funny words, dry words, sardonic words. Words, words, words. Wordshow is a collection of seemingly unrelated stories, mostly delivered through lyrical, expressive poems but occasionally through the simple spoken word. But, if you listen hard enough, there’s a theme. Subjects come and go in the blinking of an eye. We had letters to and from America, Trump given a hard time and Brexit bashed, together with an airing of the injustice in what Byron sees as the growing inequality inherent in many Western economies. But the political scepticism, cynicism even, is never rammed down the audience’s throat, largely due to his extensive lexicon which allows him to construct verse that twists and turns through humour, on to the serious point he then subliminally imparts and then back to the humour again. Byron’s comic timing is impeccable. He knows just where to accelerate the delivery, exactly where to place the pause and for how long, before releasing the punch line into the auditorium and allowing the audience time to digest and then appreciate it. There are stories about himself as an adolescent, his family as it developed, Galileo and possibly the most interesting poem ever written about mathematics which looked at Fibonacci theory. The Charge of the Bank Brigade was brief and bloody and his lexicological dexterity was further demonstrated with a series of fifty-five word pieces on completely disparate topics. That’s Byron’s strength. He sees a topic that might yield a poem or story and then researches it in meticulous detail before producing final verse that not only entertains but also informs. And his agile mind sees connections between subjects beyond the ken of most practitioners of this art form which enables him to produce segue ways that somehow bind the evening together. Words are most definitely the star in this truly excellent hour of storytelling. You could tell from the buzz as the packed audience reluctantly filtered its way out into another dank Edinburgh evening that they felt refreshed, rejuvenated, minds buzzing with the hypotheses Byron aired and the stories he’d told. Rarely have I heard the spoken word deliver so much with so little apparent effort. But every word clearly matters to Byron. As he said up-front, if you’re not angry, are you awake? An excellent show for people who like their comedy to make them think. There's literary earnestness at Writers’ Week and rowdy theatrical hi-jinx at the Unearthly Garden. But in the quiet centre of town in a rather streamlined and elegant bar where people can sit in comfort with a fine wine or cocktail and some yummy hot nibbles, there is Greg Byron, performance poet. He’s a wonderful wandering bard and, of course, there’s no better bard space than a bar space. Byron rolls up in a wonderful costume, waistcoat and long buttoned dress coat, very period and English and also very warm. He’s here from the UK under the umbrella of the Joanne Hartstone season so one knows he has class. He has a little black book which is full of his poems. He picks and chooses among them, sizing up his audience and the mood of the moment. He skips over Brexit poems and things he deems dark and dull. The US election, there’s a spot of fun. He reads a poem about the orange man. He has a poem about British political apathy, but he can’t be bothered to read it. The audience is liking him already. He’s a personable poet and has something of the actor about him. It turns out that he has had an acting career but that he has chosen life as a troubadour of rhyme and perhaps reason. His poems have a bit of a satiric edge to them. A political whammy sometimes. Whimsy. Wit. Nostalgia. Surprise, surprise, even a Fibonacci poem. That feels like a first. It’s a ripper. There’s an Attenborough poem, an eco-poem on the polluted sea, a Postcard from the Beach in Spring and there are recorded sound effects operated by Anna Thomas, behind the bar of Treasury 1860. Just for variety, he throws in some prose. It is easy to settle back and let Byron regale with his North England accent. Greg Byron is his character name. The actor behind it is Gavin Robertson and one just has to admire the very essence of him, wandering the world with nothing but a talent and poetry. It’s a perilous living. But he certainly breathes good and mindful air into the Fringe. And. methinks, he may just be first poet ever to rhyme “Aristotle" with "golden wattle". Reviewed by Barry Lenny, Wednesday 7th March 2018. In a very different type of production, defying classification in any of the usual genres, Gavin Robertson appears as his alter ego, the poet and spoken word performer, Greg Byron, in Wordshow. It is a unique blend of theatre, cabaret, spoken word, and comedy but, however you care to try to classify it, the result works incredibly well. Greg Byron is a cheerful, hearty fellow and many of his poems are very funny, but there are also a few poignant pieces, and some political comments. Robertson was on an intensive writing course in America a while back and the play that he intended to write just wasn't coming, in part due to his anger at the Trump administration. Near the end of the residency, he began writing poems, then realised that he had a show on his hands. The invention of Greg Byron was the key. This has opened up many possibilities and Robertson is now adding new poems all the time. Every day in politics, alone, provides inspiration for more satirical verses. The potential is vast. As Byron, Robertson deals differently with each poem, lending his abilities as an actor to individual interpretations of the poems. A regional English accent, a particular way of phrasing, adding pauses, varying emphasis on certain words, every poem is treated to its own particular style of delivery. He even translated on from English into Australian, and you will love the one titled Apathy. Thanks to Anna, busy at the laptop computer, some of the poems even have background sound effects and music. Byron carries his journal, flicking through it, turning over the odd loose piece of paper caught between the pages, and deciding which poem to recite next, so you might want to make a couple of visits as it seems each night might be a little different. The hour slips all too quickly by, though, and Byron leaves us wanting more. Books of the poems were brought out from England with him, but the last one was sold after the performance that I attended. They were expected to last for the entire season and, possibly have a few left to take home. This attests to the instant popularity of his work. Not all the merchandise has gone yet, so you can still purchase a printed tee shirt, if you are quick off the mark. If you want to have a satisfying and memorable Fringe, seek out the productions that don't entirely conform, because there is where you will find the little gems that others miss. This is definitely one of them, and you still have a good chance to catch it, as it is running at Treasury 1860 at 8pm most days to the 18th March, and also at 5:30 at Rastelli at the Stirling Fringe from 9th to 12th March. Be sure to book to avoid being disappointed. A chair, a poetry book, a man, and a bottle of water to wet his whistle – other than these there is no set and the stage is bare. In his Slooshy Wordshow Greg Byron departs from physical theatre for the evening to give a performance of spoken word poetry, ranging in theme from science and quantum physics, to Brexit, to memory, to what it might be like to be a woman, and even on this particular evening, just 24 hours after the terrorist attack at London Bridge, to the Manchester bombing. Byron is engaging, warm and attentive, checking for yawns, asking us who is a parent, who has cats, and offering each poem as if we were old friends sharing an evening together. His reading is accomplished, and yet humble. The words rhyme easily and wittily and they’re delivered with a Northern twang that’s at once strong and gentle. At the end of each poem I find myself sighing, ahhing or mmming along with the rest of the audience. There’s something about good poetry that makes you recognise things more clearly, and at the end of the hour I feel like my life and the world have been thrown into sharper relief. I’ve made a mental note to tell my kids to visit their remaining grandparents more and say they love them. The poet says it’ll be too late one day. There are also character sketches, cleverly observed lines about some of the eccentric individuals from a village he used to live in, and some ingenious 55 (not 54 and not 56) word stories. It was hard to clap after every piece, not because it wasn’t moving or skilful, but because it nudged the heart-strings and pushed at the mind, in a way that made me want to ponder rather than immediately respond. If you like your poetry performed and your evenings good-humoured and reflective, then this is the show for you. 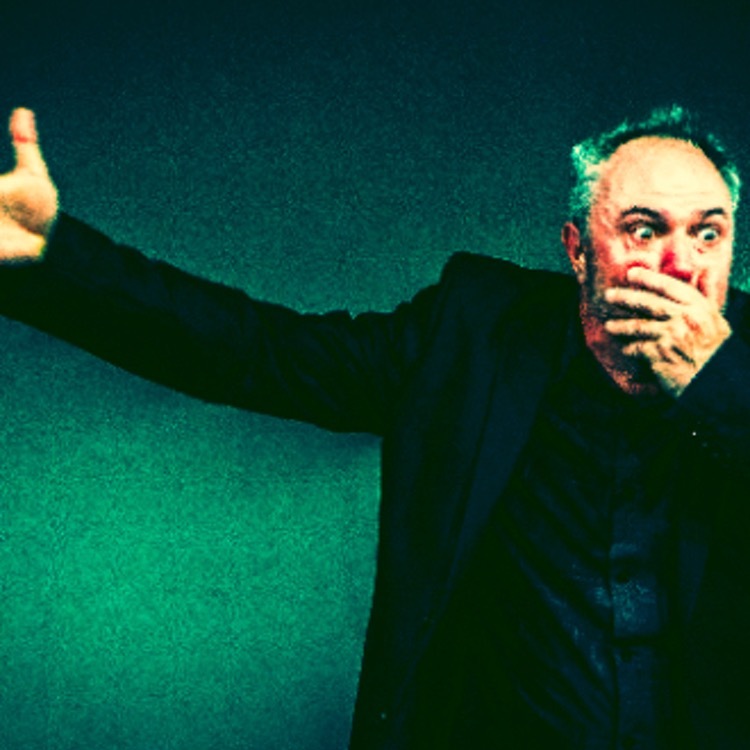 Greg Byron, the performance poet persona of actor, writer, director and producer Gavin Robertson, heads to the stage swathed in darkness; he steps in a slowly dramatic way. The lights switch on suddenly to spot an avuncular face resting his eyes upon us. Stood, with writers notepad in hand, Bryon softly begins the show. Byron is a masterful performer; with a hypnotic delivery that gently lulls the evening crowd. The portraits of people from an unspecified rural village are very funny and have us laughing hard; as does the very short poem about apathy. A small selection of science poems, including one about the Fibonacci sequence, are an interesting listen. “It’s a look at all sorts of things – my 55-word prose ‘word sketches’, character portraits, science, and ignorance, the quest for knowledge, the current state of the world around us, confusions and cruelties…” – an evening of poetry from the legendary Greg Byron. Welcome to an evening of like poetry; an hour or so in the company of Greg Byron, middle aged and ready to share his musings on life, on mortality, on our troubled present time of social media, of let down and even, occasionally, of hopefulness. A poetry gig, a spoken word variety show, a cabaret, this is low key, comedic, theatrical but mostly direct, spoken word performance. Meet a performer with the courage to be gentle, yet that gentleness accompanies and delivers a power – a power in the words and in the delivery. Greg Byron is a creation of actor and writer Gavin Roberston, an amiable companion for the evening, he chats with us, gives us a wink and a double take, and yet is a soul who has lived, and gathered these poems, these observations, reflections along the way. They are, for the most part, rhymers, with sharpish meter. The rhythm allows him to protest, to ponder, to observe the quirks of life, and also to play with that rhytmn cleverly and add accessibility and entertainment to the proceedings. No harsh poetry slammer needed here, this is direct performance, all the more impactful for its bare simplicity. A man, a set of poems a Dave-Allenesque stool and some clever, slooshy word play. This show could well be a hidden gem at the Fringe. A gem it is for its clever selection of words, its skilled delivery, its courageousness to be gentle and allowing word-play and word power to play out as a piece of live literature that is throughly entertaining; those words reach us with ease and effect. But this show of words doesn’t deserve to be hidden. It will provide value and enjoyment for both spoken word and theatre audiences. Even a comedy audience seeking out a gag-free but warm smiling hour will be well served. Highly recommended.